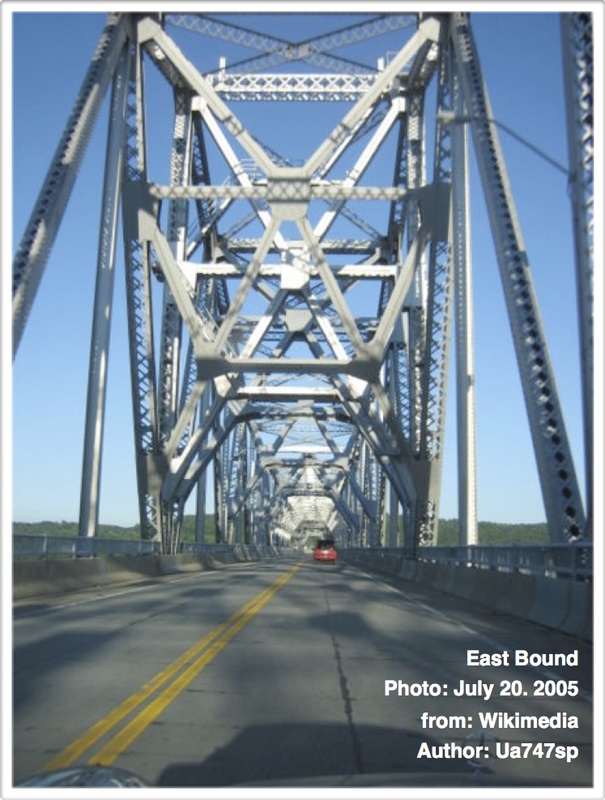 I finished my last blog telling about coming upon the Rip Van Winkle Bridge across the Hudson River some 120 miles north of New York City. Besides it being free to walk across a foot path on the right side of this mile-long toll bridge, I finished up commenting on being fascinated by how far above the river the bridge is, how wide the river is, and how green the Hudson River Valley is. But mostly I was fascinated by the fact that the Hudson River was FLOWING THE WRONG WAY ! ! It was flowing NORTH ! Over and over I worked my understanding of geography in my mind. Over a hundred miles to the south I had seen the Hudson River connect with the Atlantic Ocean at New York City. Yet here I was on the south side of the bridge and the river was flowing first under my side of the bridge and then under the roadway! Surely the river does not flow from the Atlantic up to the St. Lawrence Seaway ? ? ? It just couldn’t be. I knew there were differences between the East and the West in this great land of ours, but I was pretty sure the side of the continent did not change the notion that water flows downhill! Yet the Hudson River was right there, FLOWING UPSTREAM! I thought perhaps it was some illusion caused by being so far above the water. But as I got to the far shore I checked and sure enough, there were grasses and branches along the shore that were being pushed by the current and they were being pushed UPSTREAM ! Alas, it was getting late and I needed to put that mystery on hold. At the time I needed to got off the bridge, put out my thumb, and see what shelter may come along. I immediately got a ride from a young military man who was friendly as could be and, I’ll admit, easy on the eyes. THE TIDE ? ? ? ! ! ! Wow. 120 miles from the ocean and the tide is pushing back the mighty Hudson River ? ! I’m from the mountains of Idaho and had no idea the tide could do that! He explained that the river continues to flow under the tide and the sea comes rolling over it. Wow. I’d always heard how mighty the movement of the tides is. Considering all the rivers and basins and bays in the world, that is a LOT of water and land sharing a twice-daily sloshing around with one another! The power of it struck me just like that — the mighty mixing up of water, earth, heat, cold, light and dark that has brought a carbon-based organic celebration upon this watery rock we ride around the sun! The handsome military man ended up providing me with a place to sleep in the barracks of his camp. After being impressed with how effortless it was to get a hitchhiker to an empty bed on a military base I enjoyed a sound sleep of sloshing dreams. This entry was posted in Hitchhiking and tagged hitchhiking, Hudson River, military base, New York State, Rip Van Winkle Bridge, tides on April 10, 2015 by deansgreatwahoo. Sloshy dream? Oh my. I could use some of those. The first time I saw a river move backwards was of the Oregon cost. It is amazing the power that we are seeing there. Good story; good words.